Guiseley 0 Doncaster Rovers 1 - One of those days or reason for concern? Most pre-seasons tend to feature a game with a lacklustre performance, one which raises a few doubts about just how strong a team is heading into the new campaign. The trip to Guiseley was one of those days for Rovers. After an incredibly positive performance against Championship Derby came a lacklustre showing at National League Guiseley. Liam Mandeville scored the only goal of the game - his fourth in as many matches in pre-season - but this was a rather forgettable outing from a Rovers perspective. 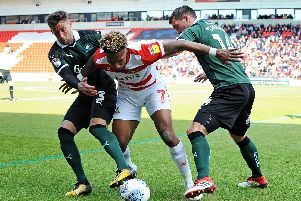 The swift, slick and incisive passing that characterised Rovers superb run to promotion last season was largely absent in a ponderous display that proved much more of a slog than likely expected. They largely dominated possession and territory but lacked real creativity to undo a hard working Guiseley outfit. They also looked rather leggy. To read to much into this of course - as with any friendly - would be foolish. It has been a long, hard and taxing pre-season so far. If there was going to be one game where a tired squad may have struggled for real motivation, this was it. Rovers will likely be much better against Sheffield Wednesday on Wednesday night. They will certainly be livelier. On that night, they will probably resemble much more of the side expected to start the season on August 5. And they will have to in performance as well as personnel if they are going to truly cement the good work of this pre-season so far. Again on Saturday, boss Darren Ferguson took the opportunity to look at trialists. Charlie Harris - formerly of Brighton and Barnsley - produced some eye catching passing but his workrate in the deeper lying midfield role was not up to standard. He simply did not work hard enough to find space to receive the ball. In contrast, fellow uncontracted midfielder Issam Ben Khemis continued his impressive run in the Rovers side with an energetic attacking performance across the full 90 minutes. A contract awaits for the Frenchman. Ferguson opted for the 3-5-2 system which worked rather well in the second half against Derby. But the problems which characterised the first period against the Championship side were all too prevalent throughout Saturday’s friendly. Rovers looked disjointed, with the three banks of players struggling to link up in the manner in which their manager expects them to play. It resulted in misplaced or negative passes with attacking play far slower than normal. Perhaps the most positive trait that has come out of pre-season so far is Mandeville’s penchant for a good old poacher’s goal. Two of his hat trick of goals at Armthorpe Welfare came from him sneaking in to mop up shots blocked by a defender or parried by a goalkeeper. For a player Darren Ferguson has regularly urged to take more chances, his new found relentless streak in the box is welcome. And he was at it again at Guiseley, bringing the only goal of the game. Trialist Harris brilliantly struck a shot from distance, catching by surprise former Rovers keeper Jon Maxted, who unconvingly parried, allowing Mandeville to nip in quickly and finish into an empty net. On the goalscoring front, Mandeville is winning the race to partner John Marquis at the start of the season. Guiseley - managed by former Rovers defender Adam Lockwood - caused problems, chiefly with their work rate and energy. And they will feel somewhat unfortunate to have not got on the scoresheet. Lively forward Reece Thompson saw a couple of one-on-ones saved while the confident John Rooney smashed three testing free kicks which forced both Marko Marosi and Ian Lawlor - who came on in the second half - into reaction stops. Rovers had other opportunities to make their advantage more comfortable. Andy Williams headed well over the bar following a superb free kick from Danny Andrew while Ben Khemis drew a decent save from Maxted after cutting in from the left. Mandeville poked wide from a tight angle shortly after the restart while Tommy Rowe - who replaced the injured James Coppinger - drilled a shot narrowly over after running onto Williams’ pass on the edge of the box. Substitute Alfie May drew a good reaction stop from Maxted after seeing an initial shot blocked but real chances were few and far between as the game wore on. Ferguson declared afterwards there is still plenty of work to be done for this Rovers squad. And few would disagree. But it is to be hoped the trip to Guiseley can be put down as simply one of those days. Guiseley: Maxted, Brown, Williams, Wesolowski, Lowe, Lawlor, Trialist (McFadzean 75), Rooney, Thompson, Trialist (Trialist 71), Trialist. Subs not used: Atkinson, Palmer, Hatfield, Green, Odejayi, Trialist. Rovers: Marosi (Lawlor 60), Mason, Alcock (Walker 46), Butler (Fielding 60), Andrew (Wright 46), Garratt, Coppinger (Rowe 55), Harris (Whiteman 46), Ben Khemis, Mandeville (Marquis 60), Williams (May 60).